See Ko Lanta from the air with these beautiful aerial videos of Ko Lanta’s major beaches and towns. Saladan Village is where most visitors arrive on Ko Lanta. It’s an interesting little village with lots of restaurants built on stilts over the water, plus several hotels and guesthouses too. The nearest beach to Saladan, Klong Dao beach is also the most busy because it’s so convenient. Klong Dao is very popular with families, and has some excellent resorts and the famous Time For Lime restaurant and cooking school. 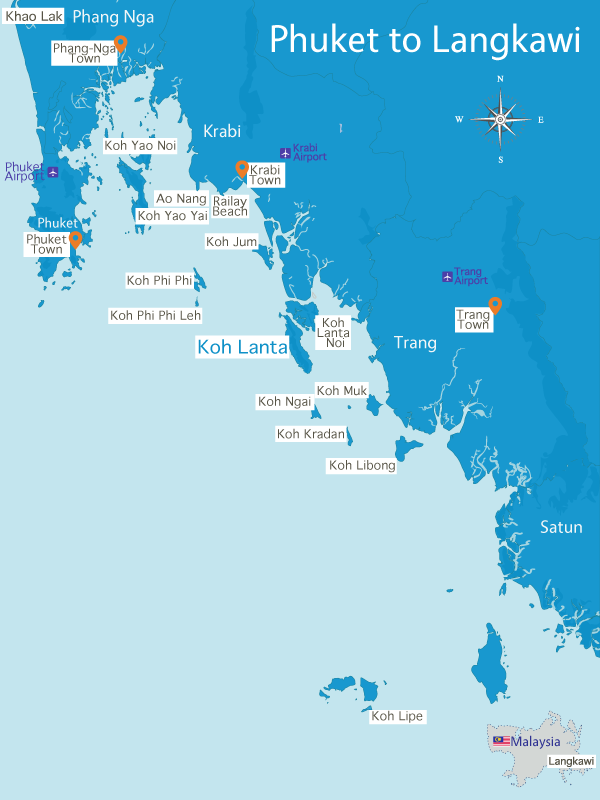 Read more about Klong Dao beach. Over three kilometres of sand and sea gives Long Beach its name – there’s enough room here to feel like you always have your own space, even though there’s a wide selection of cafes, restaurants and hotels to stay at, including the luxury Layana resort. Read more about Long Beach. A small hidden bay nestled next door to Long Beach, Relax Bay only has a couple of resorts and is popular with yoga enthusiasts and others looking for a secluded place to stay. Boasting a laid-back village vibe and some of Ko Lanta’s finest beachfront villas, Klong Nin is one of the most convenient places to stay on Ko Lanta where everything is a short walk away. Read more about Klong Nin beach. A traditional Thai fishing village, Lanta Old Town is located on the east coast of the island with beautiful wooden houses, several cafes and restaurants and a whole different vibe to the beaches. Largely undeveloped, Klong Jark beach has a handful of villas for rent nearby, along with a couple of resorts. It’s a great spot to get away from it all. Located at the furthest southern point of Ko Lanta, Bamboo Bay is where you go to escape everyone and everything else.